One of the earliest methods used to make vessels, and decorative objects may have been the technique described below. Compare this method of glass making with CORE FORMING for speed of manufacture. Compare both of these methods with GLASSBLOWING methods. Materials were mixed together and heated just to the point of fusing together. 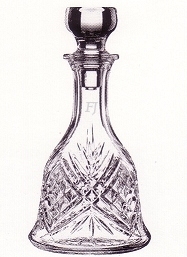 This composite, nearly glass-like, was cooled, ground into a powder, and may have been poured into a clay mold similar to that illustrated here. The mold was placed in the furnace to "e;soak"e; in the heat until the powder melted into a viscous mass. As it melted together it would "e;slump"e; down in the mold. More powder had to be introduced at the top. This process continued until the mold was full and all the powder melted. The hot mold and its contents were then removed from the furnace. Several hours later, when the mold and glass had cooled, the mold was opened and the solid glass bottle-shaped object was removed. To be useful as a vessel, the solid glass had to be drilled-out and possibly turned on a lathe to grind and polish the outside surface. Though many ancient glass containers have been found, ancient glass sculpture is vary rare. The portrait of Amenhotep II, who preceded Tutankhamun (King "e;Tut"e;) by about sixty years as ruler of Egypt, is the earliest glass portrait known. Cast and cut in dark blue glass, one or two microns&apos; thickness of the sculpture&apos;s surface changed to a light brown crust during its long burial. The object was probably modeled in wax. The model was coated with clay and heated. While the clay hardened, the wax melted and ran out, leaving a cavity of the same shape and size as the original model. This cavity was used as the mold. Jewelry and furniture inlays were often cast in open, simple molds and were complete once they were removed. All that these objects may have required was some polishing. The generic name for a wide variety of techniques used to form glass in a mold. The technique of forming a vessel by trailing or gathering molten glass around a core supported by a rod. After forming, the object is removed from the rod and annealed. After annealing, the core is removed by scraping. The technique whereby glass is removed from the surface of an object by grinding it with a rotating wheel made of stone, wood, or metal, and an abrasive suspended in liquid. See also copper-wheel engraving, carving, and wheel engraving. Shaped pieces of sandstone or sand consolidated with gypsum were often used as polishers and abrading tools to work stone in ancient Egypt. Similar tools used by stone and metal craftsmen could have been used to cut, grind, and polish glass. By 4th - 1st century B.C. lathes were commonly used to hold the object to be cut in a fixed upright position. These were reciprocating lathes. They rewound after a cutting turn, instead of turning continuously in one direction as modern lathes do. Tools were pressed against the turning glass, eventually grinding it to shape. Lathes resembled and probably performed about the same as ancient pottery wheels.